The latest Financial Times MBA ranking is officially out, with several international schools rising closer and closer to the top in 2019. Claiming the top spot is, once again, the Stanford Graduate School of Business. The Silicon Valley-based school’s top-billing comes courtesy of the extensively lavish weighted salary metric. According to recent data, Stanford MBAs earn an awe-inspiring $228,074—an increase of $13,332 in just one year. Harvard Business School comes in 2nd in 2019, rising three spots from the previous year. The Boston metro business school, not surprisingly, boasts the second-highest weight MBA salary in the world at $205,486. France’s INSEAD rounds out the top three—the highest among non-U.S. schools. In the newest ranking, INSEAD falls from 2nd overall in 2018 and 1st overall in 2017. The University of Pennsylvania’s Wharton School comes in 4th, with sudden-riser CEIBS (China Europe International Business School) claiming the 5th spot. Reigning atop the latest rankings doesn’t necessarily mean salary is the only considered factor, however. Per data provided by FT, the top earning graduates generally comes from U.S. schools. 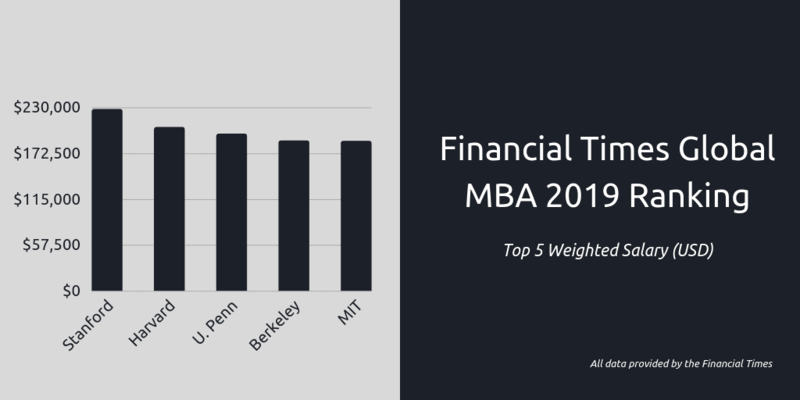 Despite outstanding salary metrics, both Berkeley Haas and MIT Sloan sit just outside the top five overall ranking, in 8th and 10th place, respectively. CEIBS launch into the top five is remarkable in its own right, however it is among many international schools seeing rankings jumps. While three international schools are within the top 10, multiple non-U.S. schools continue to witness monumental multi-year increases. Few schools within the ranking saw a better bump than the University of Oxford Saïd Business School, which rose 14 spots in just one year, up from 27th in 2018 to 13th this year. This comes just one year after the school rose six spots, from 33rd overall in 2017. In the latter half of the rankings, the Durham University Business School in the UK manages to stand out as well, rising from 64th in 2018 to 43rd this year. This may not be surprising, considering Durham’s MBA is one of the best return on investments in the world. The National University of Singapore Business School maintains its top 20 ranking, climbing from 26th in 2017, to 18th last year, and now 17th overall. HEC Paris is also enjoying a minor jump, up from 21st in 2018 to 19th this year. 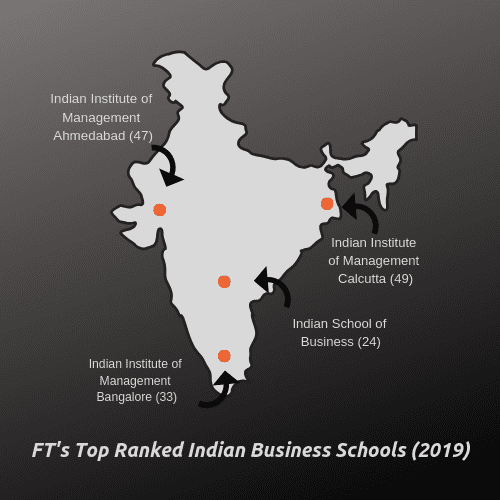 The two top-ranked business schools in India—the Indian School of Business in Hyderabad and the Indian Institute of Management Bangalore—moved up as well, with ISB moving from 26th to 24th overall in 2019, and the Indian Institute of Management Bangalore rising from 39th last year to 33rd this year. In fact, over just two years, the Indian Institute of Management Bangalore has risen 14 spots, nearing its way to the top 30. However, no Indian business school saw a better 2019 than the Indian Institute of Management Calcutta, climbing from 78th overall in 2018 to 49th this year. In 2017, the school ranked 95th overall, making for a momentous 46 spot increase in just two years. Of course, not every non-U.S. school is seeing similar results this year. London Business School, despite maintaining its top 10 spot, fell from 4th to 6th. Spain’s top ranked business school, IESE, fell from 11th to 12th in 2019. In addition, the University of Cambridge Judge Business School fell from 13th to 16th this year. Outside of the top 20, the Nanyang Business School, SDA Bocconi, University of Hong Kong, and the Indian Institute of Management Ahmedabad all fell multiple spots. The Indian Institute of Management Ahmedabad saw, perhaps, the biggest drop, falling from 31st in 2018 to 49th this time around. Amidst the litany of international business schools in the Financial Times MBA ranking for 2019, three U.S. schools outside the top 20 saw monumental gains. The University of Virginia Darden School of Business, recognized among the best schools in the world to earn a career in consulting, jumped 11 spots from last year, up to 23rd overall. Further down the ranking, Vanderbilt University Owen Graduate School of Management moves up 21 spots, up to 52nd overall in 2019 from 73rd last year. Trailing close behind is the Smeal College of Business at Penn State, which moves from the 75th spot to the 63rd spot in 2019. Several other esteemed U.S. schools saw nice bumps as well, with the F.W. 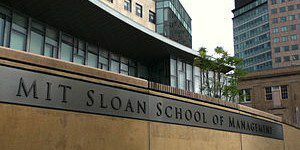 Olin Graduate School of Business at Babson College, Boston College Carroll School of Management, Boston University Questrom School of Business, and the Notre Dame Mendoza College of Business all moving up at least 13 spots in 2019. Click here to the rest of the 2019 Financial Times MBA ranking.